The toddler looks like he or she does not have enough energy to move and is about to die right there. A bird is walking towards the toddler and it looks like a vulture, who may intend to eat the toddler right after he or she dies on that spot. 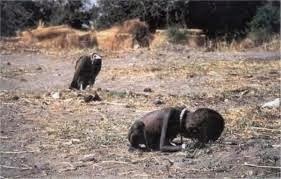 It is really saddening to see that the toddler is going to die there without anyone going forward to help him or her and about to be eaten by the vulture. I believe that there are many of these cases in Africa because many of the Africans are poor and cannot afford to buy food which resulted in the kids looking for food themselves and die of hunger during the journey.